(CNN) - Saying President Barack Obama is acting like a "king" by threatening to take executive action on gun laws, Kentucky Republican Sen. Rand Paul cautioned the president to be ready for a fight on Capitol Hill. Obama will announce proposals to curb gun violence Wednesday based on recommendations by Vice President Joe Biden's task force, which held meetings with multiple stakeholders in the gun control debate. The announcement comes just over a month after the deadly Connecticut elementary school massacre that left 26 killed, in addition to the gunman's mother. According to White House Press Secretary Jay Carney, Obama "intends to take a comprehensive approach," including renewal of the assault weapons ban that expired in 2004, a ban of high-capacity gun magazines and closing background check loopholes. Among the proposals are 19 executive actions that Obama could take without congressional approval, legislators briefed by Biden said Tuesday. But Carney noted "there are limits on what can be done within existing law" and said Congress would have to act on certain proposals "because the power to do that is reserved by Congress and to Congress." If the president does decide to make unilateral moves, however, Sen. Paul warned such action would spark intense backlash. "I've been opposed to executive orders, even with Republican presidents," he said. "But one that wants to infringe on the Second Amendment, we will fight tooth and nail." "And I promise you," he continued. "There'll be no rock left unturned as far as trying to stop him from usurping the Constitution, running roughshod over Congress. And you will see one heck of a debate if he decides to try to do this." His argument falls in line with critics who say recent legislative pushes–both at the federal and state level–to amend gun laws mark an aggressive front against Second Amendment rights. The National Rifle Association on Monday posted to Twitter that gun owners are "under assault" and argued the White House and New York Politicians "declare war on the #SecondAmendment." New York lawmakers, led by New York Gov. Andrew Cuomo, approved tough new firearm legislation Tuesday that represents the first gun control laws passed since the Newtown shooting. 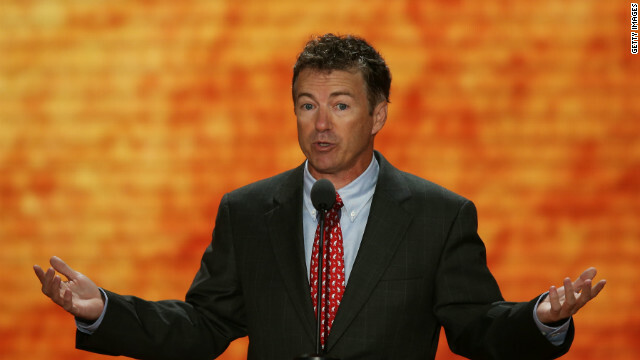 Paul, a first-term senator, has not shot down potential interest in a 2016 presidential bid. His father, former Rep. Ron Paul of Texas, is widely considered a leader among libertarians and made three White House runs, including a 2012 campaign. - CNN's Ashley Killough and Gregory Wallace contributed to this report. I support Rand Paul and his opposition to new legislation around gun control. This coming from an idiot who would like to see businesses be able to discriminate based on race, etc. At least his father had some interesting points scattered through is crazy ramblings. The son is pretty much a waste of a Senate seat. Just another dimwitted, narrow-minded teabagger. While I sometimes long for the old, more rational GOP, I have to say that I thoroughly enjoy watching the TP turning our politics into a one party system by destroying the Republican Party. I hope I am around to see the day that His royal magi-sty takes something you want. If he is successful in this then it will be even easier next time and get even easier. Then one day he will have all of the power and guess what? It will be way too late to do anything. We as Americans have to draw a line and tell the president that this is as far as he goes and we will not let him go any farther!!! On a side note you should really read what the law actually says he can do and what he cannot. The is a LARGE amount if what he can do!! Cheap politcal posturing at its finest. Last time we checked, the MAJORITY of Americans want tighter but pragmatic gun control laws while guys like Rand are more interested in protecting the NRA. Those if favor of tougher (and really not that tough at all) gun control laws should all wear a big button over their hearts with a big, fat F on it indicated the grade they're going to get from the NRA. Republicans and their fear mongering never fail to disappoint. You know all you folk's hit the nail on the head about Mr.Paul what a stupid stupid person, I don't think this man know the law of the land. I agree – I don't want the US to have either a king or a dictator. I also don't want the US congress to be filled with idiots who can't put the needs of the people as a priority over there own greed and need for publicity. RAnd Paul is proving he has a serious problem with main stream america and his brand of radical nonsense disguised as libertarianism is a joke. Oh, c'mon, Rand, we're trying to save children's lives here. Me thinks Rand's hair was curled a bit too tight; it seems to have cut off any remaining blood flow to his withered brain. Next thing you know, he'll come out in dreadlocks, a bone in his nose, proclaiming the country has gone over the cliff. Anybody that thinks there's not a complete intellectual vacuum in Kentucky had better get their feet back on the ground. Rand is spot on. We don't want a King we don't want a Tyrant. That's what we have fought for all these years. To keep this country free, and everyone has personal liberties, and ordinary people are not terrorist as they are now being treated under the rule of Obama and the DHS. The Second Amendment is not about hunting. It's about protecting out liberties from those that want to be Kings and Dictators. History is full of gun grabs, followed by mass killings.. look it up. Rand you have our full support. Paul is one of the best. Love the guy. Supported his last campaign and will do so again as long as he chooses to stay. He loves liberty unlike our current white house occupant. Let me see--How many Presidents have signed executive orders? Quite a few as I recall. I NEVER heard anyone mention that those Presidents were kings!!!!!! Rand Paul is racist through and through. He is a good redumblican because all they know is name calling. wonderful leader. Your all like sheep to slaughter! Pull your head out and think about what wonders he has done for the USA. TEA Party typeslike Paul clearly need to take a civic lesson. They obviously have no clue of the different branches of government, their roles and powers. Soo, Per Rand Pual when George Bush was doing it it was OK, because that was more of a Unitary Goverment, but when Obama does it it makes him a King? So, what was George Bush? A Dictator? Why didn't they call him that then?? "There'll be no rock left unturned......."
Well, Rand Paul certainly knows what lives under rocks. Guess he crawled out from under his to "test the waters"
in Israel for his Presidential run. A little early, isn't it. i guess all of you failed the basic government classes in school. you all are just like the sheep in 1937 germany. I thought they stopped letting crazies out of the asylum. This little jerk got elected along with the other tea twerps in the 2010 midterm election. Shame on all Democrats who sat that election out. The problems with gridlock, The Koch Bros. and creeps like this rest on all your shoulders! You say that like it's a bad thing. Being a man-god Emperor is pretty good. its called having a do nothing congress...so someone has to step up. name one thing of substance that Paul has done and theres your answer!